I didn’t grow up reading superhero comics. There wasn’t any real reason why, except perhaps that none of the adults around me did. It does mean, though, that when I talk to people about comics, and specifically how they got into them, I sometimes feel a little weird or self-conscious about how late I came to the game. Which is, of course, ridiculous: superhero comics are for everyone, and it’s never too late to get into them, and I will say so loudly and repeatedly to anyone who asks. But this article isn’t about my superhero comic origin story. This article is about me and Captain Marvel. The first Captain Marvel—Mar-Vell—is dead. Carol has a new costume (the now iconic one designed by Jamie McKelvie) and Captain America is suggesting that now’s a good time to consider a new name as well: Captain Marvel. Carol is resistant to the idea; she sees it as taking something away from Mar-Vell. Steve argues that she’s earned it, and that her old name, Ms. Marvel, marks her as an adjunct, secondary—which she clearly no longer is. By midway through the issue, Carol has shaken off her reservations and made up her mind to take up the mantle. Comics have an interesting—and difficult—relationship with legacy names. Did you know that there have been three different Iron Men? (Tony Stark, James Rhodes, and Victor Von Doom.) How many Captains America can you name? (There have been at least seven, depending on how you count.) And yet the names, sooner or later, tend to gravitate back to their original owner. Carol was Ms. Marvel from 1977 to 2012—but since 2012, she’s been Captain Marvel, and now that there’s a movie coming out where she bears that name…it’s going to be hard to pry it off her. I’m taking the damn name. Women in comics tend to suffer from a lack of visibility. (The first of Marvel’s superheroines was Sue Storm, “Invisible Girl.” Ha, ha.) They tend to have fewer prominent storylines, less of a presence on teams, and fewer solo books. Right now, out of 49 comics that Marvel is currently publishing, ten of them are solo titles featuring female characters—and that 20% strikes me as relatively high. Team books have gotten better at featuring more than a single token female character, and yet the current Avengers comic features eight members on the team and only two women. 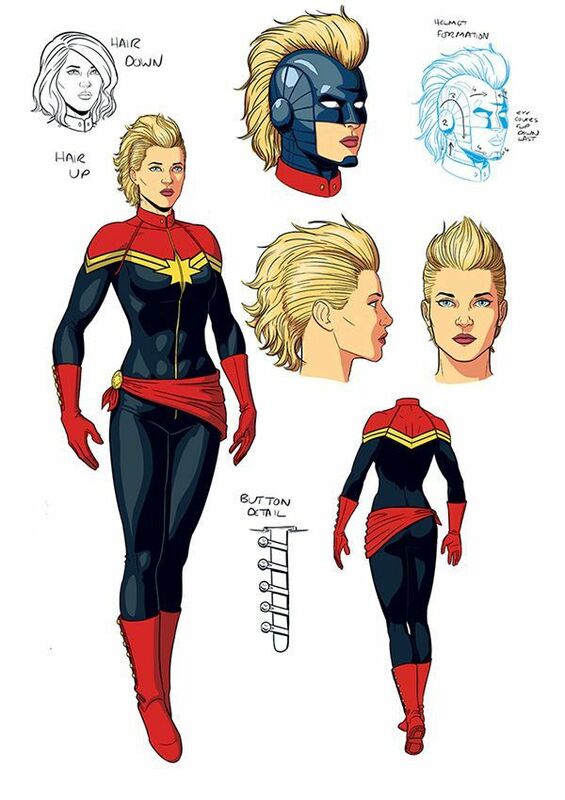 Carol Danvers is the opposite of invisible. She is a tank, an unstoppable force, an unapologetically badass. She’s brash, loud, bold, confident. She takes up space and never backs down from a fight. She punches sharks. I could use this space to talk about how Carol is a compellingly flawed character. She’s struggled with alcoholism. She can be overconfident, or sometimes self-righteous. She is, like all of Marvel’s best characters, impeccably human. And all of that is important—all of it is valuable, speaking as someone who tends to like her female characters best when they’re messy, when they struggle and stumble and sometimes fail. But that isn’t what Carol is about, and that isn’t actually what I like best about her. What I like about Carol is that she doesn’t apologize. She’s the best, and she knows it, and she won’t let anyone get in her way. She knows herself, owns herself. We all need power fantasies, and that’s mine—and, based on the number of people, particularly women, who have embraced her, I’m not the only one. Women are taught to make ourselves small. To speak softly, and stand back, and step aside. “Ambition” is a dirty word. So, in its own way, is “confidence.” None of this is revelatory to say; feminists have been talking about it ad (their own) nauseam for a long time. But it’s part of what makes those women—fictional and non-fictional—who refuse to back down and shrink themselves to fit the limited space they’re given, so inspiring, so moving, so empowering. How about another Kelly Sue DeConnick line? When the announcement about the Captain Marvel movie dropped in 2014, I remember saying that I’d believe it was happening when I was sitting in the movie theater watching the end credits. What can I say? I’m a pessimist; a part of me doubted I would ever see Marvel make a female-led superhero movie. The fact that it was pushed back by the studio—twice—only made me feel more like we might never really see it happen, like it would be one of those things that was always supposedly coming but was never quite a priority. Even now, even armed with set photos and trailers and cast interviews and a premiere date just around the corner, I still sort of struggle to believe it. It’s a crying shame that it’s taken eleven years for the MCU to get around to its first female-led superhero movie. I’m also incredibly grateful that it’s here. And—even though I’ve always been rooting for a Black Widow movie, and will continue to do so—I’m incredibly grateful that it’s her. Captain Marvel. It just feels somehow right. Looking back, it feels like Kelly Sue DeConnick’s Captain Marvel was the starting point for a flowering—a series of ripples that are still echoing in Marvel’s comics today. Carol Danvers became Captain Marvel in 2012; in 2014 a new Pakistani-American hero named Kamala Khan took up the Ms. Marvel mantle. Five years later, Kamala is in multiple team books and there are purportedly ‘plans’ to introduce her into the MCU after Captain Marvel. She-Hulk became (at least for a while) Hulk. X-23 became Wolverine. Jane Foster transformed into Thor for four years. Female characters aren’t just moving forward into the spotlight, but taking up named legacy roles—no longer adjuncts or love interests. True, most of these changes haven’t lasted, but they happened. Captain Marvel wasn’t the first, but she played a crucial role in starting this wave. One of my hopes for the movie is that she does the same for the Marvel Cinematic Universe—that she blasts through the stratosphere and blazes a trail. That she marks the beginning of Marvel’s reaching past their stable of white male superheroes and shows us all how far we can go. I’m heartened by the presence of Lashana Lynch as Maria Rambeau and the inclusion of her daughter, named Monica, in the film—Monica Rambeau, who in the comics was the first female bearer of the Captain Marvel name back in 1982. I want all those girls to come out of this movie having absorbed Carol’s fighting spirit, her self-confidence, her determination and refusal to back down in the face of adversity. I want them to have that sense of freedom and possibility where there’s nothing holding them back. So let’s fly: Higher, further, faster, baby.